Transport for New South Wales is a statutory authority of the New South Wales Government, created in 2011 to manage the transport services in the state of New South Wales in Australia. Openlearn’s brief from Transport for NSW was to design and develop ten eLearning modules to support learning of a fully integrated Rail Control System consisting of a suite of software products. 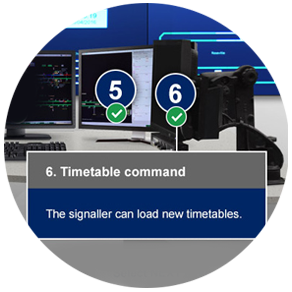 The main user interface is the RCS workstation which provides a train operator with the necessary tools to monitor and control train running, and to control signalling infrastructure components of the rail network. The audience was new graduate engineers from a wide variety of system areas in Transport for NSW including data design, infrastructure design and test areas. The first challenge was that Transport needed us to work closely with their various SMEs and stakeholders from Operational Development to clearly define learning objectives and scope and define the content, before we would be able to recommend and design interactive activities. Another challenge was to find a tone and approach that would be clear and stimulating, but not be simplistic for such an audience. Also the audience is time poor, so the modules had to be concise and to the point. Finally, there was a requirement for learners to be able to interactively experiment with the Data Configuration systems, by way of systems simulation. We developed a very collaborative approach in our analysis of the training needs. We worked closely with the SMEs to research the system, and define overviews of the system functionalities, drilling down into each component to clarify its functions and what control system data and infrastructure were involved. We developed an iterative approach to storyboarding, and included all stakeholders in finalising the instructional design in order to agree the content, and get them fully on board. We designed and developed eight 10 minute modules and two 30 minute modules in Storyline 2. We used a narrative to create a connection in all 10 modules. The central character, a new graduate, meets different experts who demonstrate their system knowledge. The design is very visual and crisp, and we endeavoured to make complex concepts, such as Automatic Route Setting and network redundancy, as simple and graphical as possible. We included many types of interactions using Storyline, to engage the learner and enable them to transfer their new skills and knowledge to work tasks. We included a system simulation of the Data Configuration systems used to add a signal to a control map, configure telemetry data for the new signal, configure Control Systems Data for the new signal and configure data on the system map for the new signal. The learning solution was developed for multi devices, and is W.C.A.G accessible to AA level.